California Organics Rewards program is a great way to save money when you buy groceries. It is FREE, easy and automatic. You earn 5% back on all purchases. The California Organics Reward Program is designed to reward our best customers. On each qualifying purchase you make, you will receive one point for each dollar you spend (excluding tax, tips and government fees). For every 200 points you receive, you will be awarded a $10.00 voucher. The more you buy, the more you earn. It’s just our way of saying thank you! 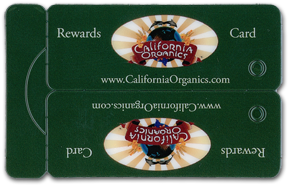 We also offer gift certificates so you can share the California Organics experience with your friends and family. Come on in and see one of our helpful cashiers to purchase.